Crop germplasm collections are valuable resources for ongoing plant breeding efforts. To fully utilize such collections, however, researchers need detailed information about the amount and distribution of genetic diversity present within collections. Here, we report the results of a population genetic analysis of the primary gene pool of sunflower (Helianthus annuus L.) based on a broad sampling of 433 cultivated accessions from North America and Europe, as well as a range-wide collection of 24 wild sunflower populations. Gene diversity across the cultivars was 0.47, as compared with 0.70 in the wilds, indicating that cultivated sunflower harbors roughly two-thirds of the total genetic diversity present in wild sunflower. Population structure analyses revealed that wild sunflower can be subdivided into four genetically distinct population clusters throughout its North American range, whereas the cultivated sunflower gene pool could be split into two main clusters separating restorer lines from the balance of the gene pool. 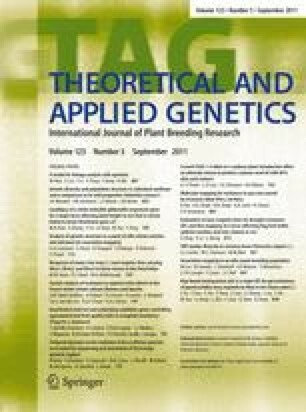 Use of a maximum likelihood method to estimate the contribution of the wild gene pool to the cultivated sunflower germplasm revealed that the bulk of the cultivar diversity is derived from two wild sunflower population genetic clusters that are primarily composed of individuals from the east-central United States, the same general region in which sunflower domestication is believed to have occurred. We also identified a nested subset of accessions that capture as much of the allelic diversity present within the sampled cultivated sunflower germplasm collection as possible. At the high end, a core set of 288 captured nearly 90% of the alleles present in the full set of 433, whereas a core set of just 12 accessions was sufficient to capture nearly 50% of the total allelic diversity present within this sample of cultivated sunflower. The online version of this article (doi: 10.1007/s00122-011-1619-3) contains supplementary material, which is available to authorized users. We thank Patrick Vincourt from INRA as well as the staff of the USDA North Central Regional Plant Introduction Station for providing us with germplasm. Patrick Vincourt also provided valuable scientific input. We thank John Hvala, Jason Strever, Michael Payne, and the University of Georgia greenhouse staff for assistance with data collection and plant maintenance. We are grateful to members of the Burke lab for useful comments on an earlier version of this manuscript. Finally, we would like to thank Brent Hulke of the USDA for helpful discussions regarding this work. This work was funded by a grant from the USDA National Institute of Food and Agriculture to JMB (2008-35300-19263).